you get past the size and weight. 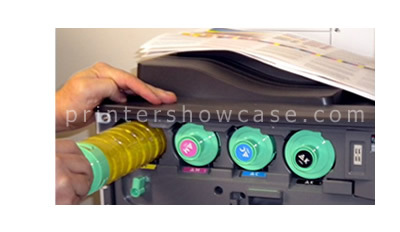 The Ricoh C840DN/ C842DN ship with the drum units pre-installed and the four toner cartridges, CMYK, plug in from the front of the printer. Setting the printer up on our network was also quick. The new large front panel, touch screen display is one of the more obvious changes from the previous model. 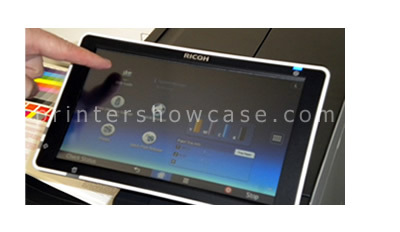 The new Ricoh C840DN and C842DN both feature enhanced 1200 x 1200 DPI output and a fast, high-powered print engine that can handle higher volume. The new (4800x1200) setting and color profiles combine to produce what we think is the best image quality in this class. 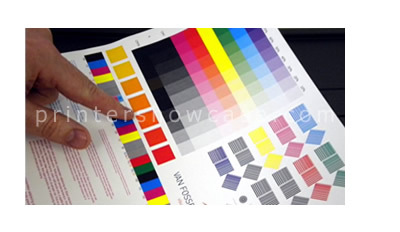 The color output we produced was very accurate right out of the box without any calibration or adjustment in most instances and the gradations produced by the C840DN and C842DN appear very smooth. Also impressive is the actual throughput speeds of both models which feature new processors and fast Ethernet interfaces, especially the C842dn which has the fastest engine speed and 320GB internal HD (optional on the C840dn). Paper handling has also been upgraded. The new models can now feed up to 12x18” size from the standard paper feeder as well as some optional feeders. 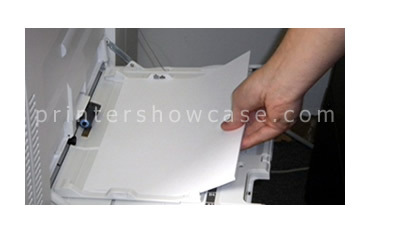 The new booklet finisher also supports up to 12x18” size allowing for the possibility of full bleed letter size booklets after trimming. There are other enhancements like the ability to auto duplex custom sizes, and media up to 165g/m2. Like their previous models, the new C840dn and C842dn are able to handle paper as heavy as 256g/m2 from any source and can feed stock up to 300g/m2 from the by-pass feeder and banner paper up to 12.6” X 49.6”. 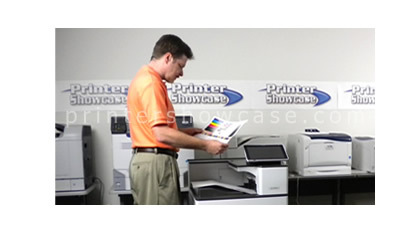 Both the C840DN, rated 45PPM in color or black & white, and the C842DN, rated 60PPM, include two (2) 550-sheet feeders plus a 100-sheet by-pass tray for three independently addressable input sources totaling 1,200 sheets. 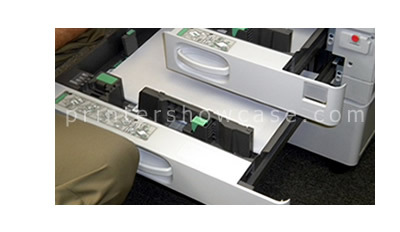 Additional paper feeding and finishing options are available to allow for many possible configurations with a maximum paper input of 4700 sheets. Three different finisher options are also available offering different combinations of stacking capacity, stapling, hole-punch, booklet making, and also a 4-bin mailbox. The Bottom Line: The new C840dn and C842dn from Ricoh are not merely an update but a real improvement overall in print quality, speed, paper handling, and toner yield. In our testing, these new Ricoh models produced best in-class print quality overall and the fastest print times in most of our speed tests. All configurations work well with current or semi-current Mac OS, UNIX or the Windows environments. They’re not small but the great print quality, paper handling, speed, and lowest operating cost combination add up big time. 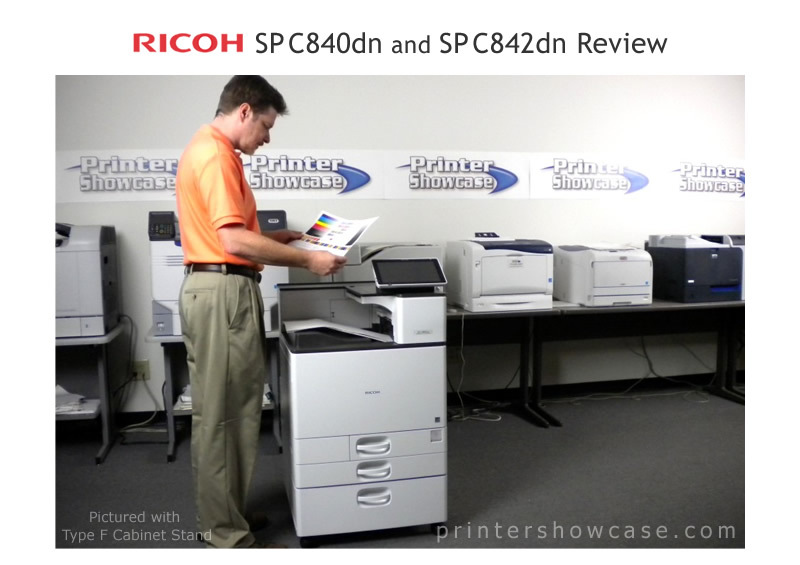 The latest C842DN and C840DN from Ricoh are a no-brainer editor’s choice.